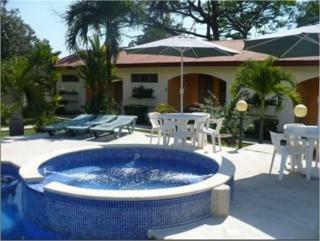 ﻿ Best Price on Villa Creole in Jaco + Reviews! Villa Creole has an outdoor pool and terraces to soak up the sun. Free Wi-Fi connection is possible throughout. The modern rooms feature light colored bedding, private bathrooms with showers and equipped kitchens. Most of the rooms also feature a seating area and a terrace overlooking either the pool area or the gardens. Villa Creole has a tour desk, offering information about the surrounding area. Various bars and restaurants can be found within 656 feet. The center of Jacó is 1969 feet from Villa Creole, and the beach is 2625 feet away. Juan Santamaría International Airport is 90 minutes’ drive away. Please note that the first night of the reservation must be paid in advance. Once a booking has been made, Villa Creole will contact the guest directly to arrange payment by credit card, $1 no refundable will be charge to check the credit card. Please note that the reception is closed from 00:00 hours until 06:30 hours. Guests arriving outside reception opening hours are kindly requested to inform the hotel in advance. Contact details can be found on the booking confirmation. Just what we needed - a quiet clean small hotel with a beautiful pool and very friendly staff Although the town is a little on the rough side you are 15mins walk out of it and it meant the location was extremely quiet. They were very good at organising the excursions we needed as well as pickup taxis to and from San Jose airport The only changes I would like to see would be better poolside equipment - the umbrellas were very flimsy. El motivo de mi viaje fue debido a que mi novia cumplía años y la quería llevar a un lugar que no conocía y que fuera bonito e ideal para esta ocasión. El hotel en pocas palabras fue incluso más de lo que esperaba, un hotel pequeño, muy acogedor, familiar, tranquilo, lejos del ruido de la ciudad pero no lo suficiente como para no poder ir a la playa o a caminar un poco. Accueil, propreté, charme, jardin tropical, gentillesse du personnel, situation.